Convert your current website or new design to a WordPress theme. WordPress started out as a blogging platform but has grown into a powerful Content Management System allowing you manage your website(s) separate from the blog. WordPress is released on the GNU General Public License, version 2, meaning that we have full access to the code. A core group of paid and volunteer developers are constantly improving on, updating and streamlining the code. Each new releases are tested by the community of developers and the interested public in beta release, and after any bugs are worked out the new update is available to the general public. 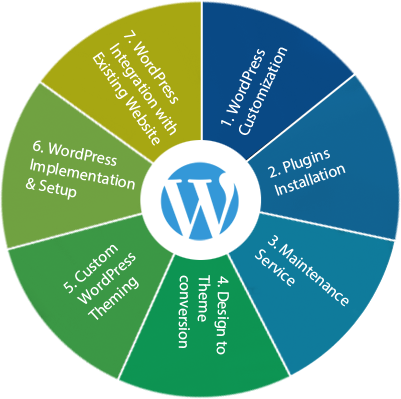 With so many users WordPress is tested on almost every system and platform there is. So if your a Mac, PC or a smart phone user you’ll do fine. Most updates can be made from with in your web browser just by clicking the update button. Editing and adding new pages or blog posts is simple and straight forward. The content editor has a word processor like interface and gives you access to the raw HTML if that’s what you want. WordPress offers fantastic documentation for it’s developers. A growing list of functions and classes with descriptions and examples are available at WordPress Codex. WordPress has grown up in a collaborative environment made up of a huge international community of developers and designers. We have many opportunities to meet and learn from each other at the conventions or WordCamps as they are referred to in the community. We can apply a totally custom design to the website and still manage the content in WordPress. This is because wordpress’s backend or engine is maintained separately to the website’s template files. So when the latest update is available you’ll be able to update the site without editing you’re theme files. WordPress has thousands of free plug-ins available, these can be installed right in the browser and un-installed just as easily. Plug-ins run the gamut of newsletters, e-commerce, contact forms, to photo galleries. If you can’t find a plug-in to suite your needs we can build one for you. Another way WordPress customized is through the theme, (template). By adding custom code to the theme files we can add exciting new features for the site’s front-end visitor, the users and the administrator. Make changes and updates to your website’s text and images without having to call your webmaster or designer. Make changes to your website through your web browser or on your smart phone.